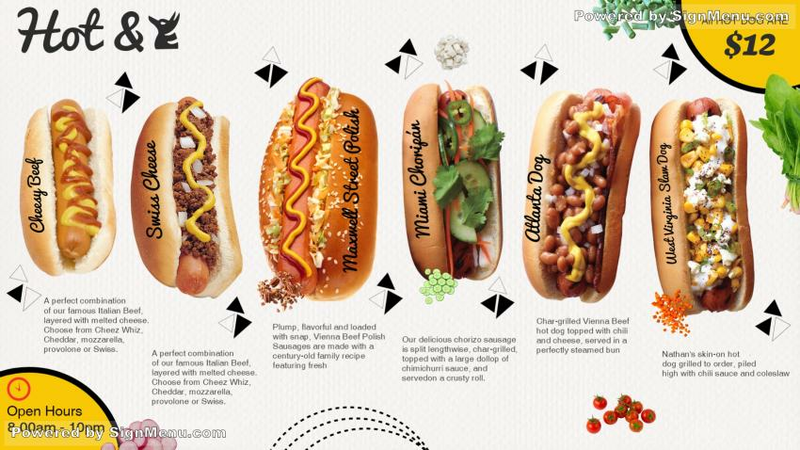 This unique and brilliantly designed menu of exclusive hot-dog specials, is best presented on a digital signage menu board and placed at the entrance of the restaurant, and even atop it's premises. The color combination - white background with multi-colors is simply exquisite - and on a digital screen will be truly riveting. You may check out on our site for more details on digital signage benefits & services and the guidance we provide on the same. This template can make your business grow 100x times ! and it is ready for download and use.